Whether you’re throwing a basketball-themed birthday party or just looking for fun drills for the team, these party games are meant to rack up the fun points. Set up a carnival-style toss game with a basketball theme to entertain guests. Begin by setting a basket, bucket, or box a few feet away from a designated shooting line. Have kids line up behind the throwing line and toss “basketballs” in an attempt to land them in the basket. You can use items such as foam basketballs, crumpled up balls of orange paper, or orange bean-bag-style balls to play this game. Give each player three balls. Award a point for each one they land in the basket. When all players have taken three shots, tally the scores and award prizes accordingly. It's easier to play this game on a court but you can also play inside with a portable hoop and foam ball. Have the first player choose any spot on the court (or in the room) and shoot the basketball from that position. If they miss, the next player in line tries from another spot. If that player scores, the rest of the players must also shoot from the same place. Any player who misses the shot gets an “O.” Once all players have attempted the first shot, a new player shoots from another position. If they score, everyone must once again attempt the same shot. Again, any player who misses gets an “O.” Players who already have an “O” get a “U.” When a player gets all three letters that spell “OUT,” they are out of the game. Play continues until only one player remains. Have one player stand on the center court line. All other players get a ball to dribble from one end of the court to the other. The center court person tries to steal a basketball as the kids pass, but in doing so their feet must stay on the line. When the center court player steals a ball, the player they stole it from must join them on the line. Play continues as the line of center court thieves grows. The last player left holding a ball is the winner. Have fun with a basketball-themed variation on musical chairs! Have kids stand in a circle and give them one basketball. As the music plays, each player must dribble the ball three times and then pass it to the next person. Whenever the music stops, the player holding the ball is out. The game goes on like this until only one player is left. In this game, one player is "It" and the rest of the players run around the court freely. Like freeze tag, the person who is "It" tries to tag other players. When a player is tagged, they must stand in place, but instead of “freezing,” they must dribble a ball in that one spot as if their basketball shoes were stuck to the ground until someone frees them. Place several buckets in different spots around the party space. 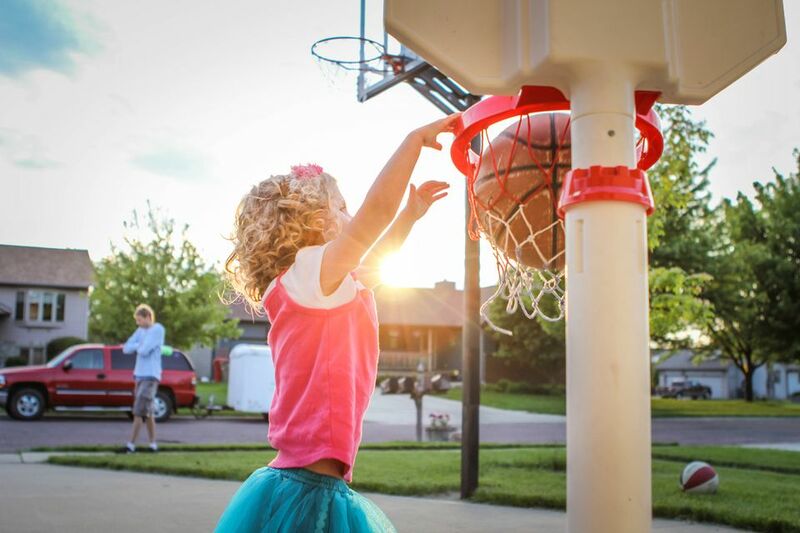 Give each child a foam basketball, set a timer, and challenge them to shoot the ball into as many baskets as possible. Score points and award prizes accordingly. You can set point values based on the difficulty of each basket’s position. This is a basketball-themed version of the popular party game, freeze dance. Play music, such as The Harlem Globetrotters' theme. While it plays, every kid dribbles and shows off fancy (or goofy) footwork while doing so. Every time the music stops, kids must stop dribbling and freeze in place. The last player to stop dribbling is out. Another way to incorporate basketball into this game is to blow a referee’s whistle instead of stopping the music. Have players stand side-by-side along a designated line. Each player must stay in their designated spot and dribble a basketball. Without moving their feet or ceasing to dribble, players must try to knock the ball away from the players next to them. As players are knocked out of the game, the line is reformed to maintain even spacing between players. The game continues until only one player remains. To play this game, you’ll need two basketballs, two baskets, and two sets of player uniforms (tank top, shorts, and basketball shoes—make sure they are large enough to fit over the players’ clothes). Divide players into two teams. At the sound of the whistle, the first players in line must put on the basketball clothes and dribble the ball to the basket. Once there, they must shoot the ball into the basket. Once they land it in, players retrieve it and dribble back to their team where the ball and uniform are handed over to the next player. The team whose members all complete the basketball relay first wins.